We enjoyed a lot the hosts Kristina and especially Johan 😍 the nice courtyard and terrace, the location, the breakfast. The staff! The owners are extremely friendly and polite. Very friendly, family run property. Lovely quiet room, extremely comfortable bed. Beautiful terraces with great view from the top terrace. The new addition of bar and light meals is an added bonus. Kristina's rooms is a small jewel, the locaton is perfect, inside the walls but in a quiet area and near the port and bus station. 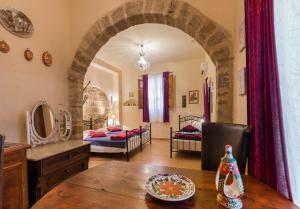 the rooms is small but this is what you can expect inside Rhodes old town. Inside the rooms you have everything includind the possibility to make a coffee or a tea. The small commomn garden is perfect to relax for breakfast or after a walk. They let you keep the luggage there if you a late flight, and you can also change yourself and take a shower before leaving. Kristina rooms is like a small familiar enterprise,they were all really really nice with us and helpful (e.g. they picked us up at the airport when we arrived, knowing it only one hour earlier), it was clean and in a really good position in the old town, with quite a nice view on the port form the common terrace upstairs. They offer the possibility,really easy, to rent a car. I cannot recommend Kristinas Rooms highly enough. Kristina, her husband and 2 sons go out of their way to make you feel at home. The rooms are great, they have a divine bar patio area and a terrace upstairs where you can drink and watch ships pass on the ocean. They have a great snack menu and make a fabulous tzatsiki dip. Well located with fabulous restaurants nearby it is well worth a visit. A large comfortable room in a quiet area of the old town. Lock in a great price for Kristina´s rooms – rated 9.2 by recent guests! 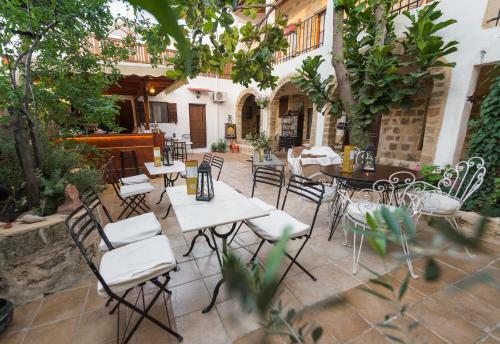 Featuring a spacious garden and a roof-top terrace with panoramic views, Kristina’s rooms is located in the Old Town of Rhodes, 0.6 mi from Eli Beach. 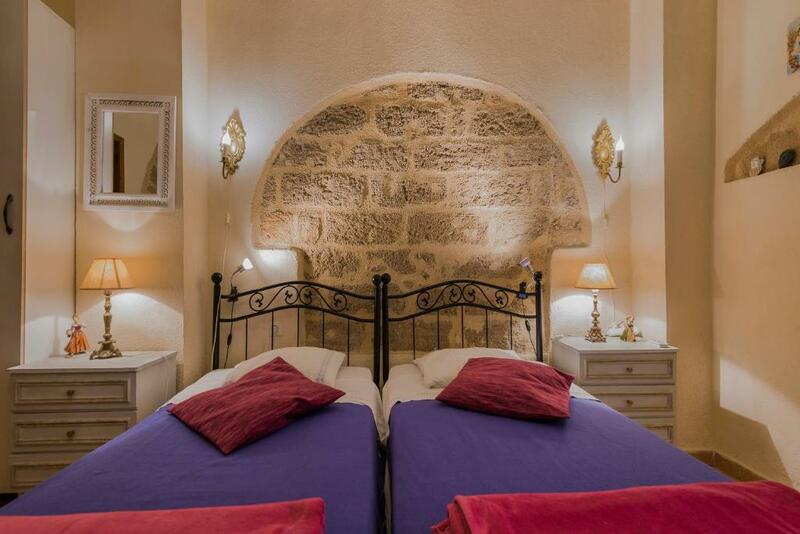 It is a 5-minutes’ walk from the center of Rhodes town, with restaurants and cafeterias. Free WiFi is available throughout. 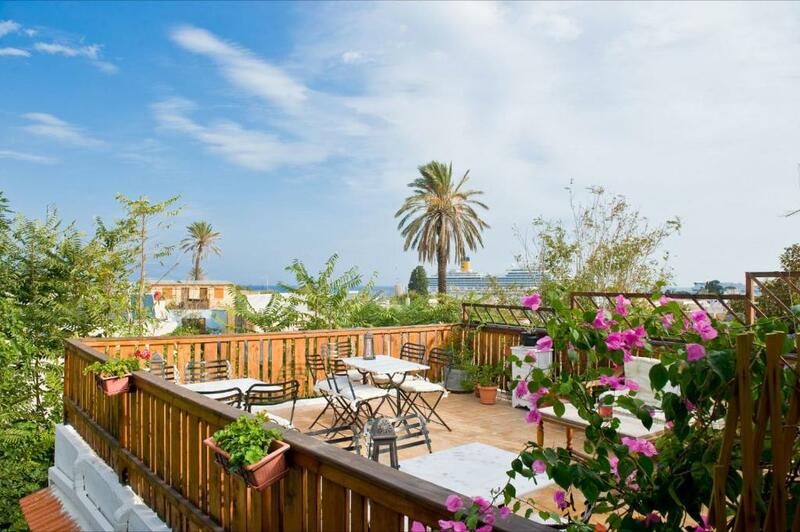 Offering a balcony or patio with sea, city or garden views, all air-conditioned studios include free Wi-Fi. They feature a kitchenette with fridge, coffee machine and electric kettle. A bathroom with shower and hairdryer is also included. Guests can easily visit the Grand Master of the Knights and the Clocktower of Rhodes. 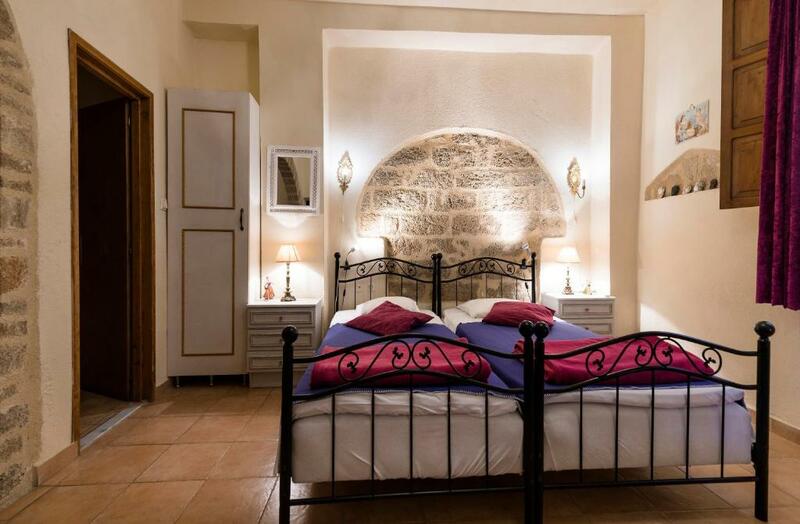 Kristina's rooms lie 2,650 feet from the port and 9.3 mi from Rhodes International Airport. Free public parking can be found within a 5-minute walk from the property. 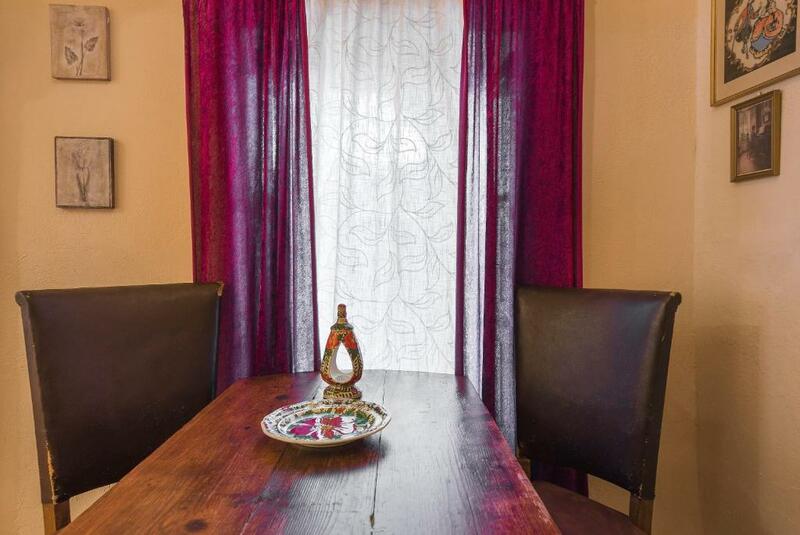 All our rooms have private shower, WC, cooking facilities, refrigerator, A/C & Wi-Fi internet. Our Hotel has for all our customers a large garden on the ground floor and a terrace on the upper floor with panoramic view over the commercial harbor and the Old Town of Rhodes. When would you like to stay at Kristina´s rooms? Offering a balcony or patio with sea, city or garden views, the air-conditioned studio features free WiFi. It includes a kitchenette with fridge, coffee machine and electric kettle. A bathroom with shower and hairdryer is also available. House Rules Kristina´s rooms takes special requests – add in the next step! Kristina´s rooms accepts these cards and reserves the right to temporarily hold an amount prior to arrival. No TV set at the rooms. Kristina’s offers a lot for not that much money in the Old Town. Our flight was delayed from Crete. We rang as soon as we landed at 11.30pm. Michael, Kristina’s son spoke to our cab driver and arranged a rendezvous at St John’s Gate (only resident’s small cars are allowed in) and was there a couple of minutes after we arrived. We found out later that for a similar price they will collect you from and deliver you to the airport. The ground floor room we had was spacious, the decoration is quite eclectic. The terrace is lovely. I have really enjoyed my stay at Kristina's Rooms, everything was absolutely perfect. The owners are amazing people, they provide you with all the info you need and they make you feel at home. We have used the private transfer from the airport to the accommodation and return and it was a great service provided by the owner Johan. I would recommend this service to everyone since taxis are not allowed to enter in the old town where the accommodation is located. Speaking about location, Kristina's Rooms is in the best position, you can easily walk to the beach as well to the port and to many shops and restaurants. The building is located very close to the Hippocratous Square and for latin music dancers/lovers just 5min away from the "Todo Bien" latin bar where you can enjoy some cocktails while dancing bachata, salsa, kizomba. Although the accommodation is really close to the bars there was no noise at all at night, actually the location is incredibly peaceful. The internal patio is fantastic and it is lovely to relax on the main terrace watching the sunset. Room has been cleaned everyday and it was really comfortable. I highly recommend Kristina's Rooms to everyone who wants to discover the beauties of Rhodes Island! The host were so welcoming and friendly The bar and food was great, we could enjoy a glass of wine in the sun shine with a great view or in the peaceful shade of the garden area. The room was a bit small. Very nice location, beautiful terrace and very helpful staff.